Do you have a major purchase on your bucket list? Whether you’re in the market to purchase a car, household furnishings or build a back-yard pool, pulling out your credit cards can be a risky option. Accumulating large credit card balances can put your credit at risk and wreak havoc with your cash flow. Follow these recommendations from the financial experts to aid in your decision making process when contemplating large purchases. In an ideal world, using a credit card for a major purchase or securing a short term loan would not be necessary. Unfortunately, for most Americans, that is not the case. For large purchases, there is often insufficient liquid cash on hand to avoid some type of credit card or loan commitment. It is strongly recommended not to withdraw any funds from your retirement accounts to complete the purchase of major, depreciating, household items. A retirement account is designed to grow over a long period of time and provide financial security in retirement. Most large retailers offer in house financing options for short and long term loans often with minimal down payment requirements. If you’re working with a representative at a furniture showroom, home builder or even a car dealership, ask to meet with their financial representative to explore options for long or short loans to complete your purchase. If you’re contemplating the purchase of an expensive musical instrument, consider taking advantage of the awesome deals offered by Groupon coupons and work with the professionals at Guitar Center to determine which of their financing options works best for you and your family. 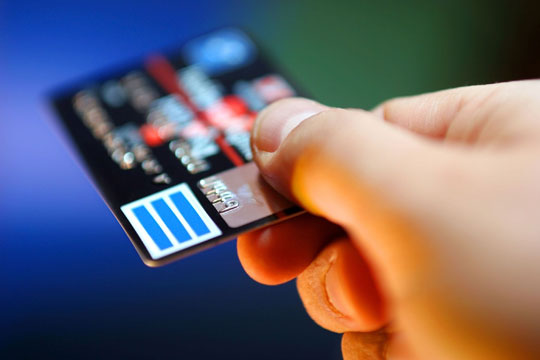 Using a credit card for major purchases can result in a substantial amount of added interest if the balance is not retired in a short period of time. Use credit cards as a last resort. If you are in the position to pay off you balance with the next statement and want to enjoy the rewards or points offered by your credit card, by all means take advantage of your credit card’s rewards program. Best of luck to you in securing financing that best meets your current and future financial circumstances.